Part 2 of Truth In Audio's restoration and modification of an EAW KF750 three-way concert loudspeaker with modern components. In the meantime, several other things were taking place. We needed to come up with a name for the system, and we wanted to give it a new color to boot. Since EAW is based in the northeastern U.S., close to Boston, we decided to capitalize on that and use the city’s grand old ballpark, Fenway Park, for inspiration. The system would be named “The Green Monster” and be painted green. 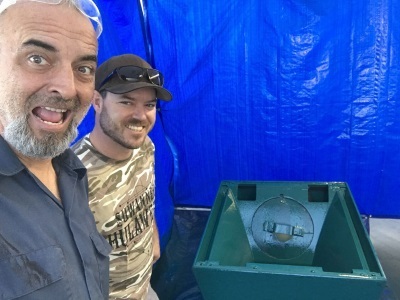 The author (left) with Allen Pettabone, who’s applying the green paint. More significantly, the original amplifier/digital processing direction was not going to pan out, putting us in major scramble mode. We put out feelers to find a new supplier, no small feat since we were only a couple of weeks out from LDI. Fortuitously, the search didn’t last long and we reached an agreement deal with RAM Audio of Valencia, Spain. Having previously never encountered the brand, I was keen to review the company’s offerings and see how they could enhance this project, and perhaps collaborate on future projects. I was surprised to learn that RAM has been around for quite some time (since 1982) and produces some truly excellent products, including onboard OEM amplifier modules. Unfortunately, we wouldn’t have enough time to implement self-powering and processing, and as a matter of fact would be lucky to even have dry paint dry on the enclosures by the show. Using silicone to smooth the transition between the aluminum horn throat and the wooden enclosure throat. At great expense on RAM’s part, a quantity of V12044 and V12004 amplifiers were air-shipped to us in California. 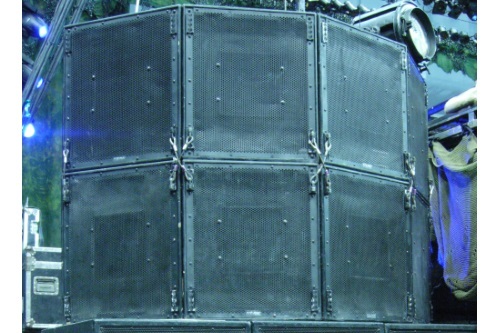 These units are specified as capable of delivering nearly 3,000 watts per channel at 4 ohms, and the 12044 version is also equipped with FIR-capable DSP. There’s even an Audinate Dante networking option to go with enough audio power to handle anything we needed. (The 12004 doesn’t have DSP but that’s not a problem because the 12044 can output signal in a daisy-chain fashion.) Frankly, I couldn’t wait to get my hands on these amps to see if they were as good as they appeared on paper. 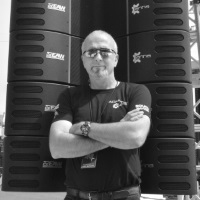 Bernie Broderick is the founder of Truth in Audio and a veteran of live production with nearly 30 years of experience from sound company owner, pro-touring FOH, systems technician to 17 years as an educator for EAW. He was also one of the initial collaborators of the ADAPTive line of products and has worked intimately with hundreds of shows and numerous tours that utilize the product line.